One might call guitarist Dave Davies an under-appreciated legend. Sometimes credited with the earliest use of guitar feedback on record – though many other including Link Wray lay claim to that innovation – as lead guitarist, harmony vocalist and occasional songwriter for the Kinks, Davies was a key part of the impressive body of work created by the quintessentially British group. The Kinks had their share of ups and downs; they fell in and out of critical favor (and commercial success) multiple times, and are notable as one of the few bands founded in the 1960s and able to make the transition to the MTV era with their dignity intact (no Jagger/Bowie styled “Dancing in the Street” videos for the Kinks, thank goodness). While the Kinks seemingly called it quits for good in 1996 – though hope springs eternal among their legion of fans – both Dave Davies and his brother Ray (the latter ostensibly the band’s leader) have remained quite busy, and in the news. That news hasn’t always been about music. Ray made headlines in 2004 when he was shot on a New Orleans street; happily, he recovered. That same year Dave suffered a stroke, and entered a long period of convalescence and physical rehabilitation. While the Davies brothers are famously combative (they established the template for sibling conflict, one employed years later by Oasis’ Liam and Noel Gallagher), in recent years they seem to have mellowed a bit toward each other. 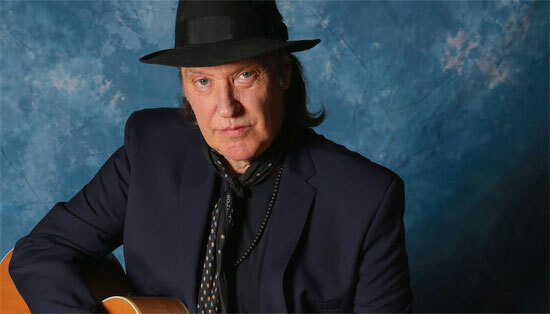 Now at age 70, Dave Davies remains quite active; ahead of his spring 2017 tour, I spoke with the guitarist about his old band, his solo career, and the tour. Bill Kopp: I first saw The Kinks at Atlanta’s Fox Theatre in 1980, not long after One for the Road came out. When I first heard the live album – and then again at the show – I remember that you opened the song “You Really Got Me” with a long and kind of uncharacteristically … for lack of a better word … wanking guitar solo. I remember thinking it was really funny. I was sure it was just you taking the piss out of Van Halen, as they had released a cover of “You Really Got Me” in 1978 as their debut single. Was it a piss-take? Dave Davies: No, we did it to surprise people. The instrumental version of “You Really Got Me,” was just a bit of fun at the beginning of the show. You released your first solo record “Death of a Clown” in ‘67, and that came out as a Dave Davies single rather than a Kinks record. Was that because you felt The Kinks were primarily a venue for Ray’s voice, or was there some other reason? No, I think the reason that came about was the fact that our managers at the time – Robert Wace and Grenville Collins – thought it would be exciting if I put out a solo record. We did, and we didn’t know what to expect. It became a huge hit worldwide, and The Kinks musicians were all playing on the record, same as they did on Kinks records as well. Robert really wanted to push me; that’s really what was behind that. For quite a few years, especially in the early days The Kinks worked with producer Shel Talmy, and you would go on to do a number of productions yourself. What if anything would you say that you learned as far as production skills and techniques from working with Shel? I think what Shel was good at … he’s very personable; he is very good with people. And sometimes all that you need is someone who makes you feel good and makes you feel like everything’s going well. It’s like the A&R people inside the music business. I used to like that idea of A&R people who would help with a project. Shel was very supportive of our work. Something that I find interesting, especially in light of your studio skills, is that more than half of the records that you’ve released on your own are live albums. Are you one of those people who thinks that studio recordings, no matter how well they’re done, don’t quite capture the essence and energy of a live performance? They’re two very different areas, and they’re both interesting in their own right. A studio album often has a kind of introversion to it, but a live show always have that more open feel about it, so each requires a different approach. But I like both; I like recording and I like going up on the platform. To my mind you’ve always been pretty solidly on the rock end of the musical spectrum. When The Kinks went in that sort of theatrical direction in the ’70s, did you personally have any misgivings about that? Yeah, I did. You know, I wasn’t really that keen on it, but I knew it was an area that Ray needed to explore. So I was getting more involved in getting into the studio together and getting more into engineering and production and that side of things. And then I saw the benefit of that theatrical approach when we went on tour with Preservation . I realized that it gives you a chance to express yourself differently. When you dress up and you take on other characters, it helps, I think. The Kinks released more than two dozen studio albums and covered a whole lot of different styles. Looking back on that material, do you have a favorite Kinks album? Oh, man … it’s hard. I’ve grown to really appreciate all of our music, whereas at one time I couldn’t bear to hear some of it. But I think every album has its own little important spot in our career. Arthur (Or the Decline and Fall of the British Empire)  has always been a personal favorite of mine, but I love them all.